It’s been five months since we got to talk Formula 1…and quite frankly, that’s five months too long. With Easter nearly on us, it’s finally time to polish up those new paint jobs, warm up the 1.6L hybrid V6s, and get racing once again. Formula 1 is back! 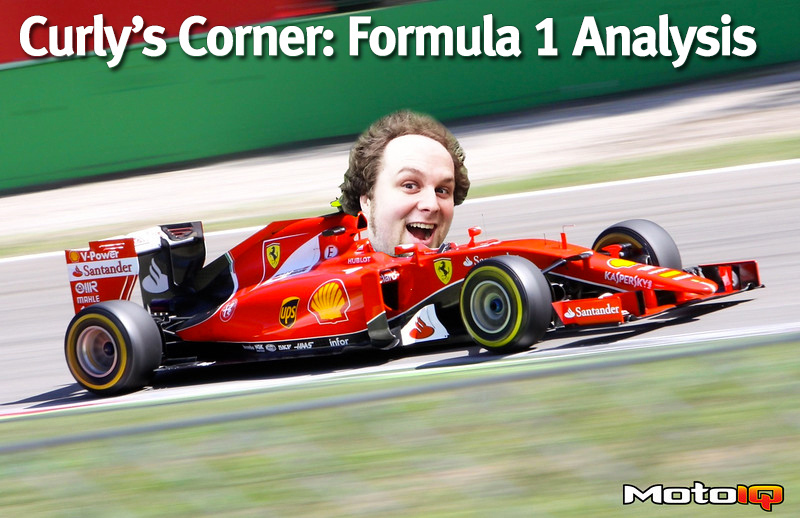 To coincide with the changes in F1 right now, we are changing the format of Curly’s Corner. Last year we tried a weekend recap, attempting to add some insight where we saw fit. That kind of analysis can be found just about everywhere, and by the time we get these written up, that aspect of the race has already been picked to death. Instead, we are going to try and highlight a few key stories each race. Some will be race specific, some we will return to as the season progresses. Picking a few big stories and following them through the weekend (or even multiple races) will be far more interesting than a simple re-cap with dad jokes thrown in. So without further ado, let’s look at some of the interesting things we saw in Australia! Pre-season testing didn’t tell us a lot. During the first week of testing in Barcelona, we learned very little, between the bitter cold and actual snow that fell on the teams as they tried to shake down their new cars. Even when the weather did cooperate, teams were holding their cards close to their chests, so testing really didn’t give us a very clear picture of who was fastest and by how much. Come race time, Hamilton was still quick, but he was also unable to pull away from Raikkonen’s Ferrari. In race trim, the two cars were fairly evenly matched. Mercedes’ “Party Mode” definitely gives the W08s an advantage in qualifying, but it seemed in race trim. The Ferrari and Mercedes were very close. This isn’t hugely surprising; after all, the big engine rule change in 2018 is that teams only get three Power Units for the entire season. Part of the strategy mix in 2018 will be knowing when to turn up the engine for pace, and when to cut back to preserve the hardware. Hamilton did this once it became clear he was not going to be able to get around Vettel. With Mercedes confined to a 2nd place at best, Hamilton was told to conserve the engine to help it last the distance. This is something we will likely see a lot in 2018- drivers being forced to conserve their engines for most of the early races to keep the motors intact. This is a long winded way of saying: I don’t think we’ve seen Mercedes really stretch their legs yet. 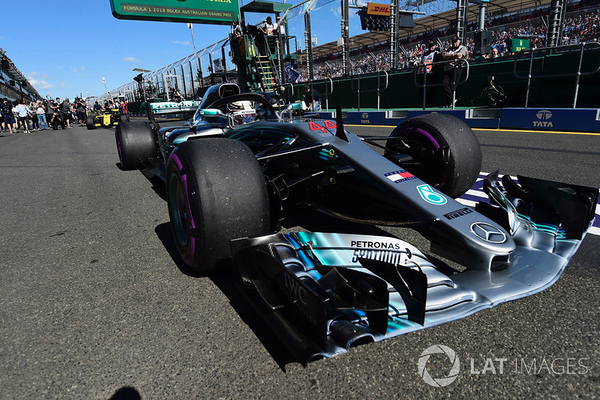 We saw a glimpse of their speed in qualifying, but with the high difficulty of passing in F1 right now, there is no need for Mercedes to push too hard if they’ve got the track position advantage. If Mercedes comfortably has a half second advantage in its pocket when it needs it, “Hammer Time” is going to be a lot of fun to watch. Yes, actually! Early in testing, Haas was in the weeds, but during the final few days Kevin Magnussen raised some eyebrows by landing himself 6th on the time sheets. Practice in Australia was a mixed bag, but come qualifying, sure enough- Haas was right up there, with both cars making it into Q3. Then at the start, Kevin Magnussen got a great start and was able to nab 4th place from Max Verstappen in the first corner! Now Hamilton and the two Ferraris were much quicker than the Haas’, but they were fast enough to keep Max Verstappen and Red Bull at bay. In fact, Verstappen was trying so hard, he ended up spinning in Turn 1, putting Haas 4th and 5th. 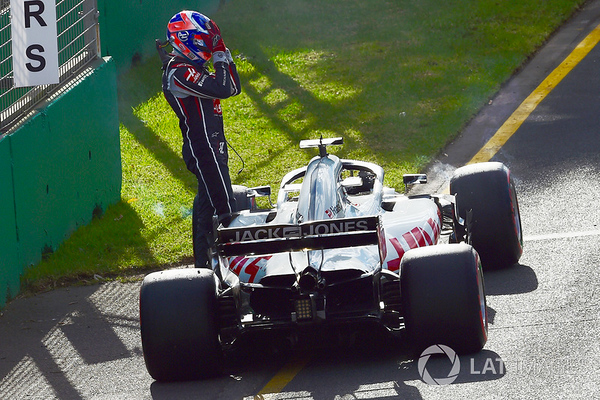 Haas was set to score an easy 4th and 5th, but absolutely blew it in the pit stops. Both cars suffered wheel gun problems and both lost wheels after coming out of the pits. The team was understandably devastated, as they threw away their best ever team finishes. The fact that Haas was looking this strong is still a very encouraging sign. Haas slipped badly at the end of last year (a deliberate move to focus development resources on the 2018 car), but their gamble seems to be paying off as they are looking very strong in 2018. The real trick will be maintaining this speed. Force India may have slumped in the off-season, but don’t expect them to just give up their 4th position without a fight (not just for pride reasons, but also because the extra payout from 4th to 5th is key to Force India’s survival). You can bet they will have their sights squarely set on overtaking Haas. McLaren is also looking strong (more on them in a minute), and Renault is looking for podiums. Don’t forget that as a factory team, Renault’s management has to answer to a board of directors. Nissan-Renault isn’t going to dump millions of dollars into F1 if Carlos Sainz and Nico Hulkenberg aren’t spraying champagne soon. Haas may have the early advantage, but they are going to have to scramble like crazy to keep it. Year-long development has not been their strength so far (to be fair they have never had a reason to push development through an entire season in their two short years in F1), and that lack of experience and resources to develop a car for a full season may be what comes back to bite them. Only time will tell if Haas can maintain their momentum throughout 2018. How Does ESPN Screw Up A Broadcast They Have No Part In? I’m not sure how ESPN screwed up, but the first 20 minutes of “F1 On The Grid” was a total mess. ESPN bounced between video with no audio, and commercials for 10 minutes, then played a replay of “The Dominant 20” for the next 10. By 12:50am, they finally got it all worked out. Fortunately, ESPN only screwed up the pre-race and did not miss any of the actual race. Well, unless you count placing commercial breaks at the worst possible moments and missing the restart on Lap 28. ESPN’s coverage of racing was termed “Always Bad Coverage” by IndyCar fans for years due to their inability to cover racing properly. And, you know what? I can understand that ESPN has zero control over the content they’re airing, but Jesus, cutting off David Croft mid-sentence is poor broadcasting. Missing the restart after the two Haas cars were cleared is ridiculous, but business as usual for ESPN (who missed two of the three restarts during the St Petersburg IndyCar race earlier in March). Is this a tough broadcasting challenge? It is. Could it have been taken care of with a bit of planning? Absolutely. Just another reminder that ESPN doesn’t care about any sport that requires more than one ball. Racewars 2018- Top Speed Racing Done the Australian Way!